Home-Made 4th Of July All-American Burgers! Prepare patties: In a medium bowl, mix ground beef, salt, pepper, Worcestershire sauce, and egg. Use your hands to form 4 equally sized patties. Cook burgers and onions: In large skillet, cook patties over high heat, about 4 minutes for medium or 5 minutes for well done, turning once midway through. Place 1 slice cheese atop each burger and cook 1 more minute. Remove patties from skillet and place on wire rack. Reduce heat to medium, add onions, and cook, stirring occasionally, until golden brown, about 6 minutes. Remove skillet from heat. Assemble sandwiches: On bottom half of each roll, place 1 burger and top with tomato, lettuce, pickles, and onions. Cover with top of roll. 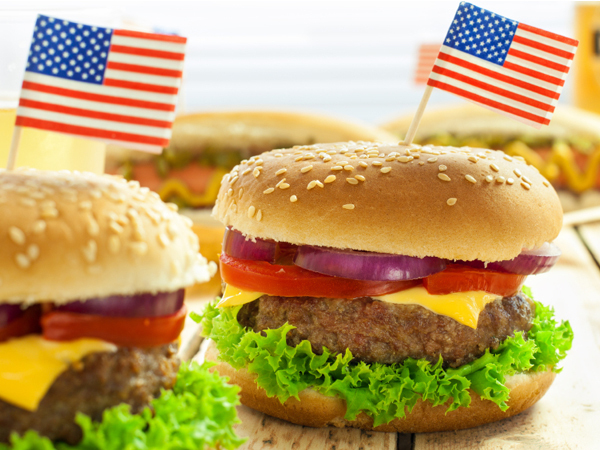 Serve with ketchup and decorate with an American flag toothpick. A Must-Have For Fashionable Foodies!